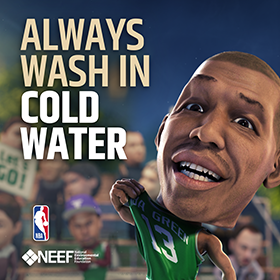 NBA Green launched the NBA Green Energy All-Star campaign highlighting the NBA’s commitment to energy efficiency and renewable energy. 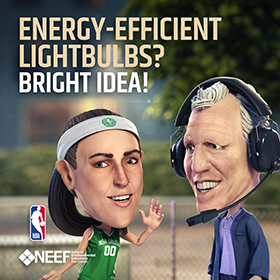 NBA Green partnered with the National Environmental Education Foundation (NEEF) to create a vignette featuring NBA legends Bill Walton, Dikembe Mutombo, Jason Collins and Felipe Lopez and former WNBA superstars Swin Cash and Ruth Riley as animated bobbleheads during a timeout huddle. 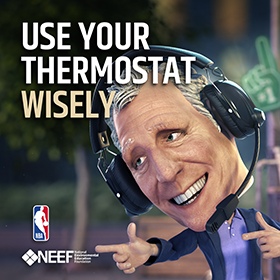 Players share energy-savings tips, reminding fans of the simple, everyday things we can all do to save energy, save money, improve health and have a positive impact on the environment. 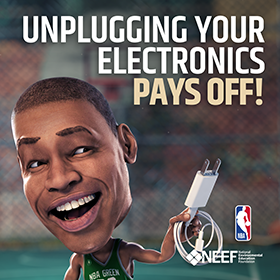 Unplugging electronics when not in use can save you as much as 10 percent of your electricity bill. Learn more about phantom energy. 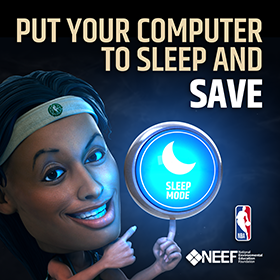 Put your computer to sleep to save energy, improve data security and help the environment. Learn more about setting your computer to sleep mode. Washing your clothes in cold water can help them last longer, save you money and reduce air pollution. Learn more about cold water washing. Replace the five most-used lightbulbs in your home with ENERGY STAR-labeled LED lightbulbs to save up to $75 per year. Learn more about efficient lighting. 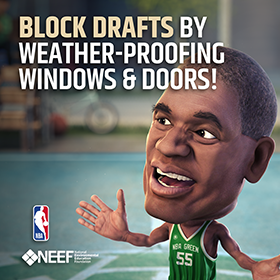 Seal air leaks and add insulation to your home to reduce noise, minimize dust and insects, and reduce your energy costs. Learn more about weatherizing your home. Buying and properly setting a programmable thermostat can allow you to “set it and forget it,” so you save money and still stay comfortable! Programmable thermostats can save you up to $180 per year. Learn more about programmable thermostats.